The capital city of Thailand is one of the most unique cities in the world, mixing centuries of rich history with extreme modernity in stark contrast to one another. It seems something exciting is happening on every block, perhaps the reason Bangkok is the most visited city in the world for tourists. 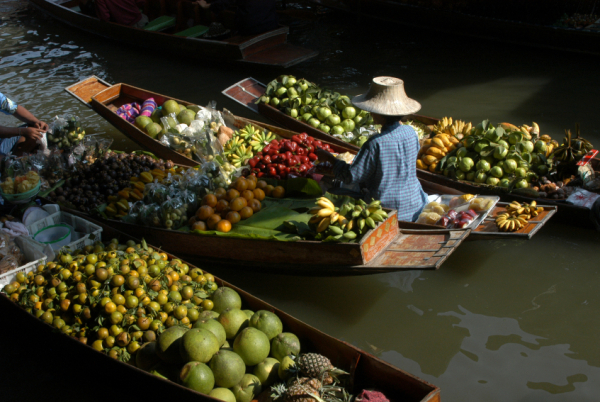 The Damnoen Saduak Market is the most popular floating market in Thailand. The canal is filled with vendors selling a variety of fruits and vegetables. You will see several vendors and shoppers floating along the canal in small row boats, selling and exchanging their goods. The whole family will have a blast at the biggest aquarium in Southeast Asia. Siam Ocean World houses hundreds of different species in exhibits occupying about 1,300,000 gallons of water. Visitors will be amazed while they walk through the ‘Open Ocean’ zone, a 270-degree underwater tunnel filled with the ocean’s deadliest predators. A glass-bottom boat provides amazing views into the open ocean. The aquarium is divided into seven zones of wonder. The ‘Weird and Wonderful’ zone houses rare and bizarre-looking creatures, such as giant spider crabs and frogfish. Watch fascinating reef dwellers roam the floor in the ‘Deep Reef’ zone. The ‘Living Ocean’ zone teaches visitors how sea animals survive in the ocean. Take a hike through the ‘Rain Forest’ zone which features blind cave fish, giant water rats and otters. The ‘Rocky Shore’ zone displays penguins and other marine mammals. Children will enjoy touching the skin of starfish in the petting pond. Observe colorful jellyfish in the ‘Sea Jellies’ zone which is beautifully filled with LED light. Thailand’s first 4D theater is housed in Siam Ocean World, featuring thrilling realistic movies. Families will enjoy working together in this exciting and challenging escape adventure. This unique themed voyage is set back 100 years in time. Play the part of a famous London detective as you solve a murder mystery set in an old house in Bangkok. Families will work together as a team to find clues and solve puzzles against the clock. Dedicated game masters are in the rooms with you to help when needed. After the 90 minute game, you can chat about your experience in the luxurious lounge over a cup of tea and then dress up in period costume for photos.